MEPA Permitting - Stamski and McNary, INC.
Massachusetts Environmental Policy Act Permitting, or MEPA Permitting, is required in a number of instances when permitting is required with state agencies. Also, if a project site is located within an Area of Critical Environmental Concern (ACEC), virtually all projects larger than a single family house require at least the most basic filing with the Executive Office of Energy and Environmental Affairs. The process can be simple or extremely complicated with the need for multidisciplinary expertise to navigate to a successful result. Our firm has been involved with numerous successful filings under MEPA with varying degrees of responsibility; from project leader to Civil Engineering contributor. 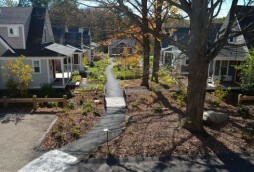 Concord Riverwalk, Developed by NOW Communities, is a compact, sustainable, neighborhood in Concord, MA, permited under the Planned Residential Development (PRD) special permit process.